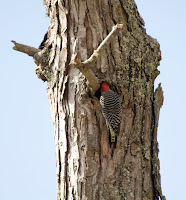 As I was catching up on my emails this morning I heard an angry Red-Bellied woodpecker calling in the tree in the front yard. I noticed her hopping up and down and around the trunk in a very agitated manner. Suddenly a starling's head appeared from the back side of the tree. The two birds pecked and flew at each other angrily. I suspected there was a nest hole that they were fighting over. The tree is a Silver Maple, which I really don't like. They were popular trees to plant in the 1950's and 60's, probably because they were cheap to plant. So, back to the birds... I ran and put the telephoto lens on my camera to try and get some photos. I had to prop the camera on the window to try and steady it to take some movies. Unfortunately, the movie I took of them scuffling was too long to download here. Later, I went outs ide to see what the commotion was all about. Sure enough, there was a 3-inch hole in the trunk just below a s mall branch. That tree has been losing branches over the past few years, so it is probably not going to live too much longer. 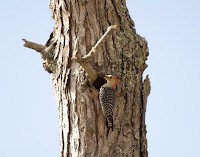 The woodpecker soon flew up to inspect her prospective home. I don't know how long she has been staking out this claim. It wasn't long before I heard the familiar whistle of a starling. She had flown to a nearby tree before making her move. They are such nasty birds in every aspect! They are dirty, loud, obnoxious, non-natives tha t drive off our beautiful native birds. Soon the starling was sitting on the branch. 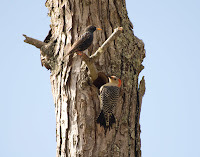 Mama Woodpecker got riled and quickly let the starling know she was not welcome (left)! Look at how her tail feathers are spread as a warning. It was a relief to see her triumph as she entered the hole! 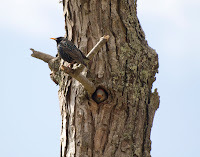 :) I hope she will be able to nest there, it would be fun to watch the babies as they grow and learn to fly. I noticed the birds are singing a lot more now, probably in an attempt to find a mate. The next few weeks will be a busy time for the birds and other animals as they begin to seek out mates and make new homes! Later... I saw the birds going at it again, so I put my camera on the spotting scope and tripod and took it outside to the road. I was amazed to watch the male woodpecker fight one of the starlings; it was just a blur of feathers (left)! After I ran my errands (I finally found the perfect dress to wear in Curtis' wedding! ), I headed over to the Oak Ridge Marina (what's left of it!) and took some photos of the birds with my camera attached to my spotting scope. I know that is a terrible, run-on sentence! My high school English teacher would have had a fit with that! As soon as I parked the car, two strange ducks came waddling up to the door. They were half-breed white barnyard and Moskovy ducks. This one has the head shape of the white duck and coloring of the Moskovy duck. Note the tiny green feathers on the neck; at least it didn't get the ugly red splotchy markings that the Moskovy's usually have. I'm used to seeing hybrid Mallards, they are not choosy breeders! ;) Here is a pretty female mallard warming her feathers in the sun (right). I also enjoyed watchi ng the Coots. They are such funny birds with their oddly webbed feet and their red eyes. The sea g ulls will not be here much longer, they will be heading north in just a couple of weeks. It seems so strange to see them in the parking lot of Kroger and Walmart all winter long! I didn't realize they have the orange markings around their eyes until I zoomed in on this one with the spotting scope. I was thrilled when Kenny and I got home last night and I heard the message on the answering machine. It was from our friends Terri and Rod wanting to know if we wanted to go hiking in the Smokies to see the snow. We had stayed in the lower elevations yesterday, so we had only seen "big" snow from a d istance. Kenny couldn't go today, so I went with them. I was glad Chris, Amanda, and Belinda had gone to Newfound Gap on Friday, it was packed with people up there today! Many people with large vehicles parked sideways in 2 spaces, so that didn't help find a place to park. Newfound Gap is on the Tennessee / North Carolina line. Here is a photo of Terri next to the half-buried sign. There had been 2 feet of snow up there, not counting the huge mounds that were piled up from the snow plows earlier in the week. W e stayed there long enough to get some pictures and then we headed down the mountain to the Alum Bluff trail. This is a very popular trail that leads to Mt. Leconte. We didn't plan to hike to the top since there is 3 feet of snow up there! We were so glad we all had Yak Trax on our boots. These rubber and coiled wire devices slip over the soles of the boots and help with traction on snow and ice. I was wearing Kenny's, so they were too big. One of them kept slipping over the toe of my boot. Rod finally tied it on the bottom with parachute cord, that did the trick. As we were hiking along the lower part of the trail, I noticed thousands of tiny black specks in the snow. Suddenly some of them started moving! 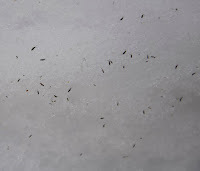 I finally realized they were Snow Fleas (right) Hypogastrura spp., a type of springtail that can survive on the surface of the snow. I sure picked a lousy time to not take my macro lens! :( I took some photos with my regular lens, but the critters are hard to see! Click on the photo to enlarge it, they may be a bit easier to look at. The trail was so pretty with the snow, a nice change of pace for us. I enjoyed seeing the shapes and patterns. Here are some shadows of Yellow Birch trees in the snow. I decided to convert them to black and white. Our biggest challenge came when we reached the Arch Roc k. Here, Rod is crossing the bridge in front of the arch. It is always a tricky place to hike because of the steep slate rock steps, but today it had ice. We saw some large icicles along the trail. Terri took this photo of me next to one. By the time we had lunch and then got to Alum Bluff, the sun had warmed the rocks and overhanging icicles to the point that they were crashing down. We decided not to risk getting impaled by a 3-foot long spear of ice and turned around before getting below the cliff. So, even though we came short of our goal, we really enjoyed our 5-mile hike today!